“Everything that has a beginning has an end,” is the Oracle’s final comment to Neo. Although there have been continuous rumours about a sequel to the Matrix movie trilogy, I assure you, this blog post is the end of ‘The Communications Matrix’. As explained in the previous post, ‘The Communications Matrix’ is an aid to logical thinking and a means whereby a project may be structured and described for analytical purposes. 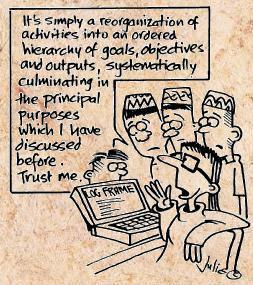 It further develops the ‘management-by-objectives’ approach. You can connect the dots at the end of this chapter, where a beginning is added to the end. Some years ago I worked as a communications officer at Acción Contra el Hambre, an international NGO in Spain. I was responsible for developing internal communications tools. Unfortunately I didn’t follow my own recommendations from part one of this trilogy, – as I simply ignored them and aimed for quick visible results. Having said this, during my time in Madrid, not only did I learn more about internal communications, but I also had the opportunity to delve into the Logical Framework Approach (LFA), as well.